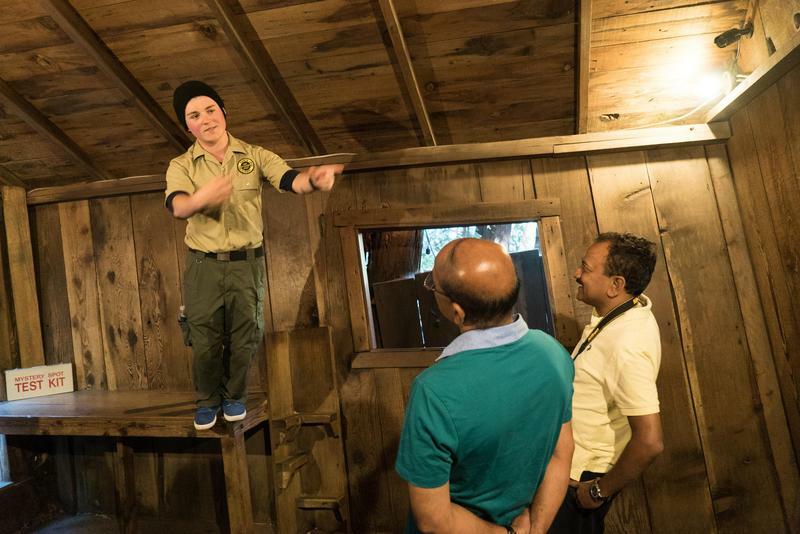 Tour guide Rob Oberto demonstrates the strange qualities of the Santa Cruz Mystery Spot. Tour guide Rob Oberto rolls a billiard ball seemingly uphill on a piece of wood. Visitors look into the the Santa Cruz Mystery Spot’s crooked cabin. 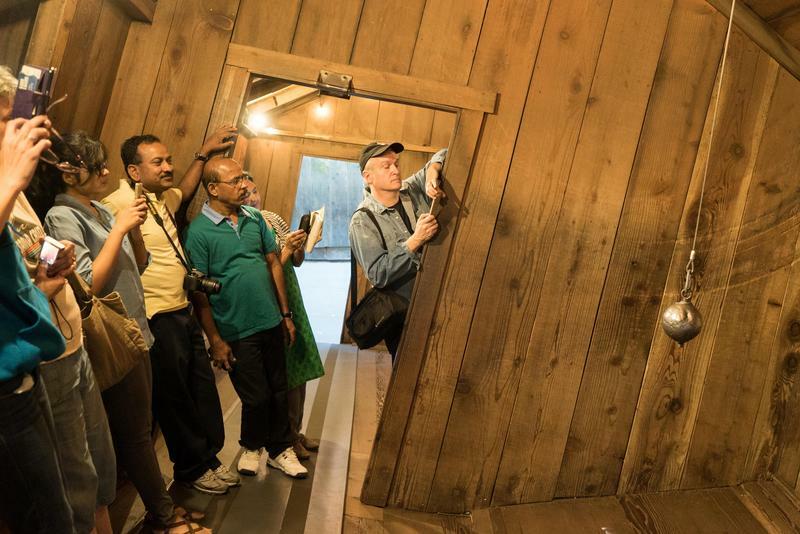 Doug Kirby of Roadside America takes a photograph at the Santa Cruz Mystery Spot. 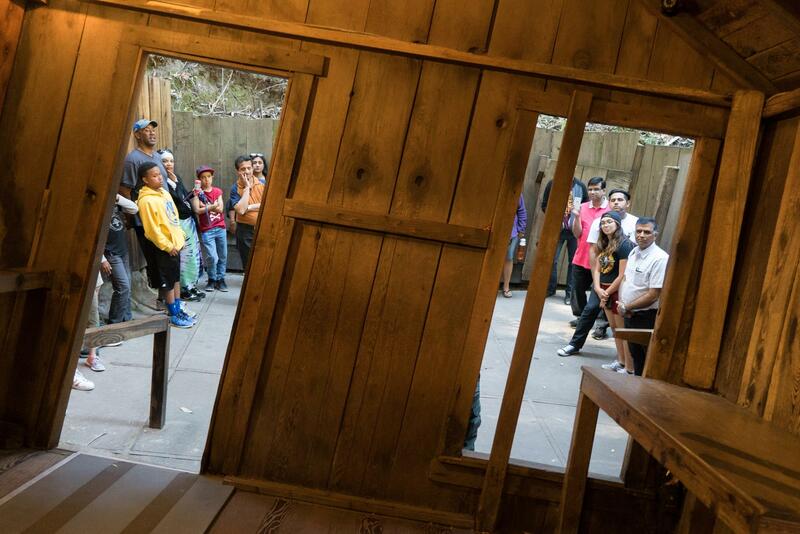 People look at a balanced level between two concrete slabs at the Santa Cruz Mystery Spot. Though the slabs are level, visitors will appear to shrink or grow depending on which side they stand on. 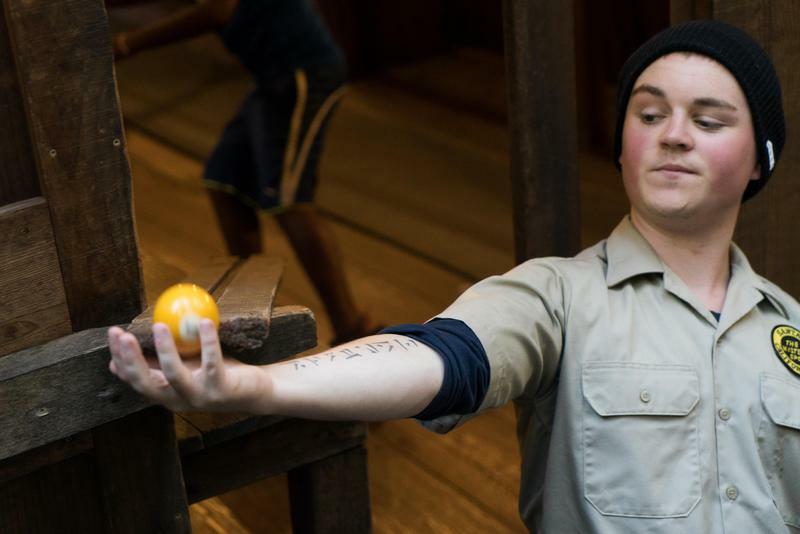 Tour guide Rob Oberto places a balanced level on a piece of wood at the Santa Cruz Mystery Spot. He leads a group of a dozen skeptics through a series of demonstrations, which are clearly meant to hush the naysayers. The tour takes visitors through the small piece of hilly forest, less than an acre in size, where strange phenomena seem to occur. Trees grow in warped shapes, people lean at unnatural angles and animals keep their distance. First, Oberto calls for two volunteers. 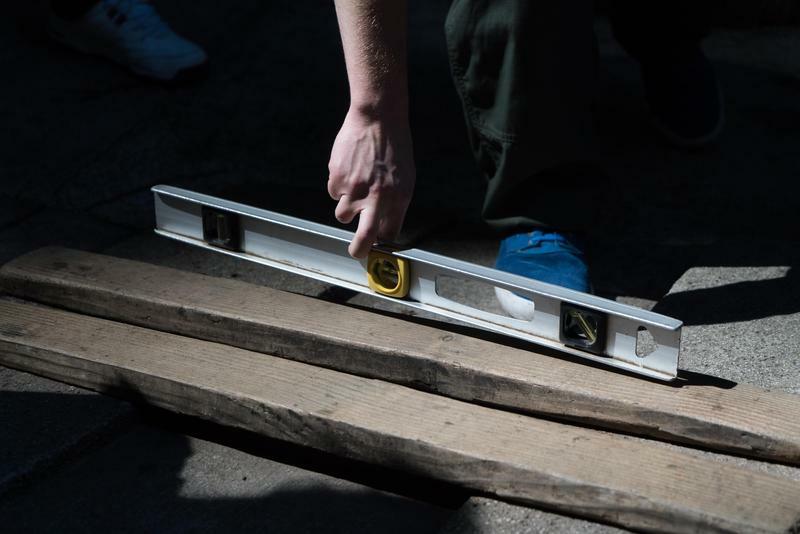 A man and a woman step forward onto level concrete slabs and face each other. She’s standing just outside the invisible border of the Mystery Spot. He’s inside. “So as you can see, you’re looking at just about the top of her head, and you’re looking at about his bottom lip,” he tells them. The man is definitely taller than the woman — right? Well, Oberto makes them trade places. People seemingly growing and shrinking is just the start. Then the tour makes its way up a hill to a crooked wooden cabin, where things get even stranger. Inside, it’s like a two-room fun house, with tilted walls and an angled floor and ceiling. People are standing at 17-degree slants without falling over, easily walking up the wall and watching a billiard ball roll uphill. The experience is disorienting. Some can’t walk in a straight line, and one kid turns a bit green before making a beeline for the door. These are some of the effects that the attraction’s founder also felt. In 1939, George Prather, a car mechanic and inventor, “discovered” the Mystery Spot. The story goes that he hired surveyors to study this property because he wanted to build a summer home. But the workers noticed strange things. They became dizzy when climbing up the hill and their compases read north when it should have been south. Prather didn’t want to keep this place to himself, so he opened the Mystery Spot in 1941. Around that time, similar roadside attractions started taking off as the highway system was expanding, says Doug Kirby, co-founder of a guide to offbeat attractions called Roadside America, who was also on Oberto’s tour. He credits some of the Santa Cruz Mystery Spot’s success to its location. Because visitors have to make their way up to the woods and take a long bumpy driveway to get there, Kirby says that adds to its legitimacy in the sense that it’s a special place. However, there is no one theory behind this vortex. 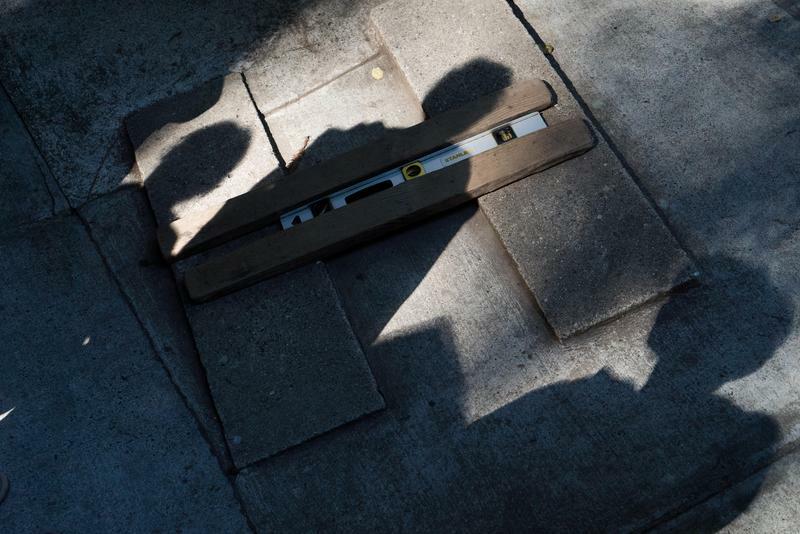 Some think there’s a fracture in the faultline, which causes people to hallucinate. While others think an alien spaceship is buried underground. But UC Santa Cruz psychologist Bruce Bridgeman claims to have solved the mystery. He says it’s all about the power of perception and explains that we take cues from our surroundings to shape our perception. Bridgeman doesn’t think he’s a killjoy. He argues that knowing the science behind the Mystery Spot makes the experience all the more richer. Back at the tour, Shafei Le, a tourist from China, agrees. Her reasoning: It’s good to keep people speculating — something the Mystery Spot has done now for 75 years.